You probably know by now that burning fossil fuels to heat your home, run your appliances and drive your vehicles creates carbon dioxide (CO2) and other greenhouse gases (GHG), but you may not have thought about the GHG produced with watering, mowing and fertilizing landscapes. The problem is that there are not good tools for calculating this. Carbon and other GHG calculators do not typically include the embodied energy of water nor landscape maintenance in their equations. Irrigation Water. There is little data on the GHG footprint of delivering water, and even less on the materials and construction of the distribution systems. The EPA Watersense web site talks about the link between water and energy, but only in terms of the energy saved by reducing the amount of water that is heated in the home. There are no references to the embodied energy required to store, treat and deliver water in the first place. How might one calculate the embodied GHG in potable water that is used for irrigation? You have to dig pretty deep in the literature, if it exists at all. Portland, Oregon actually has data. The Portland Water Bureau’s total CO2 emission for 2007 was 13,998 metric tons. The greatest source of carbon was the electricity needed to treat water and operate their water system (81%), followed by fleet fuel (15%), natural gas (3%) and employee air travel (1%). According to Portland, between 0.38 and 0.47 metric tons of CO2 are produced per million gallons of potable water delivered to the user. This averages to approximately .001lb. of CO2 per gallon of water for a city that claims it uses little energy for pumping, compared to many other communities. In other communities, where all water is pumped (e.g. Florida and other areas that have flat topography) and the electricity comes from coal fired plants, the carbon footprint per gallon could easily be triple, quadruple, or even ten-fold that of Portland’s. In communities that have a non-potable water distribution system, the carbon footprint would be less because the water is not treated. However, the water still needs to be stored and delivered. Let’s do some simple math. Assume a water carbon footprint that is four times that of Portland’s because of the need to pump the water (.004 lb. of CO2 per gallon). If a homeowner with 3,000 square feet of turf grass applies 36 inches of irrigation per year (which in Florida, would be a super efficient irrigation system), this equals 67,320 gallons of water per year, or 269 lbs. of CO2. Mowing. Let’s add in the GHG of the gas used for mowing. Lawn mowing contributes 5% of the total United States GHG’s, according to the EPA, and one gas-powered lawn mower emits as many pollutants as 8 new vehicles driving 55mph for the same period of time. 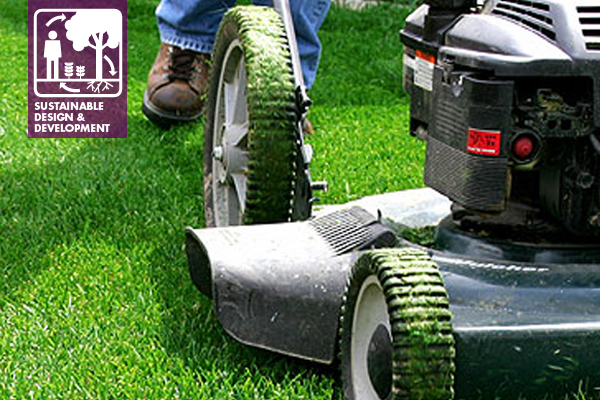 How much gas is needed to mow a lawn through its growing season? Twenty minutes of mowing per week, for 6 months, equals 8 hours. Using the above source, this equals 8 cars driving 8 hours at 55 mph (total 3,520 miles). At an average of 21.5 miles per gallon for a passenger vehicle, this equals 4,000 lbs. of GHG (19.4 lbs. of GHG per gallon). Fertilizer. How about fertilizers? A March 10, 2010 Time Magazine article stated that Tropicana, the large orange juice producer, found that each half-gallon carton of juice is responsible for 3.75 lbs. of CO2. Thirty-five percent of that carbon footprint was from fertilizer. According to research papers, for most forms of nitrogen the embedded energy (or carbon footprint) is approximately 1 lb. of CO2 per pound of nitrogen in the fertilizer. Those that include ammonium nitrate have a footprint of 2.6 lbs. of CO2 per pound of nitrogen. (West 2002, Robertson 2000, Snyder 2007, EPA 2004). For turf grass, a University of Minnesota publication recommends that 3 lbs. of nitrogen fertilizer per 1,000 square feet be applied 3 to 4 times per year. This equals 27 to 36 lbs. of CO2 for our 3,000 square foot yard example. All told, the water, mowing and fertilization of this example landscape may be in range of 4,300 lbs. of GHG annually. To put this in perspective, this is the equivalent of approximately 222 gallons of gas consumed in a passenger vehicle. New emissions regulations that go into effect on mowers constructed in 2011 will help reduce this, but old mowers are going to remain in operation for a very long time. In summary, it took a long time to find the various sources for doing this simple calculation. What our industry needs now is a tool, calibrated regionally and by water provider, mower type and fertilizer type to calculate the actual GHG emissions from landscape maintenance practices. We also need to change our landscape maintenance practices to realize reductions in GHG, as recommended in The Sustainable Sites Initiative Guidelines and Performance Benchmarks©, Section 8. Turfgrass is a cultural affect – a memory of the English landscape we can’t seem to let go. Considering the vast resources it demands, it might be valid to question it outright, considering that it is irrational, uneconomical and environmentally indefensible. What would or could the American cultural landscape be, post-turf? Landscape Architecture should consider the merits of such an exploration, at least as one probability and solution. Good question. If we designed our communities more like European villages, and provided turf grass for only the highest use park areas, we would certainly have a different landscape. The challenge in the US is that land is abundant and relatively cheap, and so are energy, water and natural resources. I believe that until the life cycle environmental cost is calculated and charged for production and use of resources, people will continue to waste them. In Southern California the picture is probably worse than you have described. About 18% of the energy used in CA is used to pump water, either from the Colorado River or from the delta of the Sacramento River. One small ray of hope is the use of electric lawn mowers. We had one when I was a kid and aside from occasionally cutting the cord, it was great. Cheaper to buy, cheaper to use, lasts forever and always starts. On a planning level, denser housing leads to much smaller lawns besides the other pluses of easier public transit etc etc. In Las Vegas, NV and in Long Beach, CA homeowners have been motivated to convert their front yard lawns to garden settings using drought tolerant plants. I am a LEED AP,landscape designer operating in Orange County,CA and the prospect of removing turf areas from landscapes other than where they are needed for athletic recreation is a widely considered prospect. The state of California is actively legislating to control emission levels in gas powered equipment used in the landscape industry, building industry and more. The property owners in Southern California are recognizing that the american love affair with large lawn areas can’t last forever. can u give me more detail about this topic.thanks. Perhaps. Can you please explain what detail you are requesting?